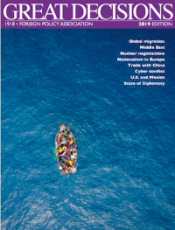 Karen Jacobsen‘s article “Refugees and Global Migration” has been published as one of eight topics in the Great Decisions 2019 edition. Today, no countries have open borders. Every state in today’s global system has its own laws and policies about who is permitted to cross its borders, and how they will do so. In the article Karen asks: Who determines whether someone is a refugee or a migrant? How have different countries, including the United States, reacted to migration? How effective are the international laws, policies and organizations that have evolved to assist and protect refugees and migrants? Karen is also featured in the Great Decisions season 47 accompanying TV show. Watch the trailer here.